Wild animal park with a palace in the background just an hour and a half outside of Grafenwoehr. Photo by Alexis Tucker. GRAFENWOEHR, Germany — Have you ever seen a majestic deer up close? Would you like to feed dozens of them in an open field as a palace sits in the background? You can do just that at the Wild Park at Schloss Tambach any day between 8 a.m. and 5 p.m.
A special highlight of the wild park is the bird flight demonstrations they do in the summer. For a little extra, they offer workshops on falcons plus the opportunity to take pictures with these stunning birds. In addition, the park is popular for the open land area of which dozens of deer roam. The deer will approach you in pure wonder and innocence. Suppress your delight as you journey through the woods and they tag along. 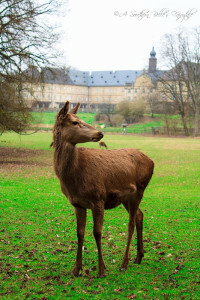 The Wild Park at Schloss Tambach is near Coburg, which is about an hour and a half away from Grafenwoehr. Your family will have that overwhelming feeling that I imagine the characters in Jurassic Park felt when they walked into the pasture as dinosaurs roamed. Sure, deer are not as epic as dinosaurs, but when you see a hundred of them in a lush, mossy green pasture with a palace in the background, you will surely feel as if you have seen beauty for the first time. The animals vary widely from moose to sheep. If you go during off season, due to the park being so large, you won’t have any issues with people interrupting your bonding time with the animals. You can bring your dog on a leash (except around the bird flight demonstrations) and your stroller. And you won’t have to worry about the crowds in the least bit. If you’re lucky, you may be able to also observe the zookeepers taking data on the wolves or another species. Listen carefully, and you will overhear the zookeepers talking about the packs and referring to them by names. Afterward, you can feed the rams and enjoy the park or trampoline area with your children. In addition, the park features a beer garden. Park officials can even arrange a picnic for you to have elsewhere in the park if you would like to be near a particular animal exhibition. The connecting ticket booth sells stuffed toys of the animals, mugs, coloring books and t-shirts too. Grab a souvenir to remember your favorite animal. The wild park’s website, www.wildpark-tambach.de, is in German. No problem. Go to Google Translate and drop the web address in and read in English. Cost is €8 for a day ticket for adults during low season (Nov. 9 – March 11) and €9 during the rest of the year. Children age 3-14 years: €4.50 (peak season €6). 2 adults and 3 children is €28 euro (peak €32).